Sun., Aug. 30, 2015, 7:35 a.m.
A GRIP ON SPORTS • One quick question. If Steven Hauschka’s field goal last night had traveled a foot less, would you still feel the same way about the Seahawks this morning? Read on. • Final results shouldn’t have anything to do with how you perceive an NFL preseason game. But, in reality, they do. 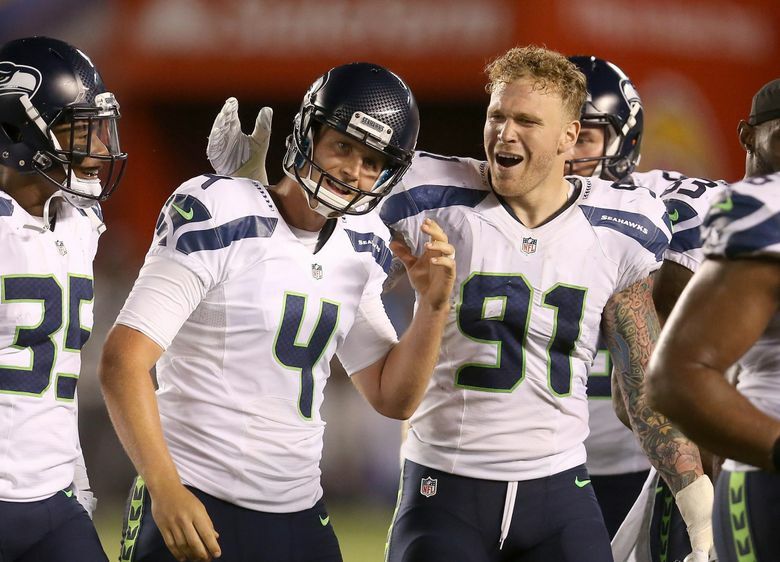 So when Hauschka’s 60-yard attempt snuck over the crossbar with 12 seconds left, giving the Hawks a 16-15 victory last night, our happiness meter ticked up a point or two. And made me wonder what the heck was wrong with me. Why would I care if Seattle won a meaningless August game unless it actually had some meaning. And why would that be? Maybe it’s because of how the Hawks won. Their defense seems to be rounding into something resembling regular season form, even if Kam Chancellor’s absence seemed more glaring last night than the previous two weeks. And maybe it’s because Tyler Lockett is a certifiable excitement machine, a kick returner with the ability to make you actually watch punts and kickoffs, well, because. He is a threat every time he touches the ball. Or maybe it’s because the Hawks were able to win with Russell Wilson looking a little out of sorts. The franchise quarterback didn’t play like one last night, missing open receivers consistently and making poor decisions throughout his nearly three quarters of play. So maybe the satisfaction with the victory came about because the Hawks had played at such a mediocre level it was a surprise they were still able to pull one out. Which doesn’t bode well for down the road. • We mentioned Chancellor previously and his replacements, Dion Bailey and DeShawn Shead, were the focus of my attention much of the game. I’m not sure I liked what I saw. My guess is, if they have to fill Chancellor’s role this season, the major distinction won’t be in big plays. They both are solid enough, no matter who is on the field, the defense won’t break down and start yielding giant gains over the top. Nope, that won’t happen. But what may happen, and this is even more insidious, is an extra two or three yards will show up here and there. Chancellor is a stop-you-in-your-tracks tackler, probably the best strong safety in the game in that regard. Which means Bailey and Shead aren’t as good. They just aren’t. I counted four times last night when one of the two made a hit and the ball carrier or receiver picked up a couple extra yards after they had wrapped up. Nothing major, mind you, just four times instead of the offense facing a third-and-7, it was facing a third-and-4, as an example. And that adds up. It doesn’t mean the Hawk defense won’t be elite – heck, the duo might be better in pass coverage than Chancellor – but it will chip away at its status. On the positive side, however, I couldn’t perceive any other Hawk trying to cover for Bailey and Shead, trying to do their job as well as his own. That’s a good thing. There seems to be a level of trust, that can only help down the road. If it’s needed. • WSU: The smoke blowing into Pullman yesterday forced the Cougars inside, which means Jacob Thorpe doesn’t have a practice report. He does, however, have interviews to watch, with Mike Leach giving his thoughts and Graham Harrell and Ken Wilson answering five questions. ... Jacob also has his final position preview, this one on the quarterbacks (mainly it’s on Luke Falk) as well as his morning post with links. ... Being it’s Sunday, we add a few links of our own, most of which come from Eugene, where everyone and their brother George are reacting to Vernon Adams’ quick ascension to Duck starting quarterback. ... The San Francisco Chronicle is ready for the Pac-12 season to begin, looking at the drama in Los Angeles and rating the teams around the conference. And, lest we forget, covering California and Stanford. • Gonzaga: The lifeblood of any major college basketball program is recruiting. We all know that. The Zags picked up a transfusion yesterday with a commitment from a French forward. Jim Meehan has more in this story and blog post. ... The Zag volleyball team won a couple matches yesterday. • EWU: The Eagles had to cut short their scrimmage yesterday due to the high winds and bad air. Jim Allen has more in this story. ... Jim also gauged the players’ reaction to Adams earning the Ducks’ starting spot. His first game in Eugene will be next Saturday against EWU of course. • Shock: The Arena Football League season is over and the best team money could buy, the San Jose SaberCats, won the title with a 68-47 victory over Jacksonville in Stockton. Former Shock quarterback Erik Meyer (pictured) led the way on offense, though it was San Jose’s defense that decided the game. • Chiefs: It’s been a while since Derek Ryan was a mainstay for Spokane. But the hard-working forward hasn’t forgotten his roots. John Blanchette caught up with Ryan this week when he attended the Chiefs training camp. The story of Ryan’s long journey to the NHL is worth reading. • Indians: It took 12 innings but the Indians picked up a 3-2 win over Vancouver at Avista last night. Chris Derrick has the game story and a blog post on the Indians’ golden opportunity to take the lead in the eighth, a chance they squandered. • Seahawks: We touched on the main elements of the win in the column above, including Lockett’s electrifying punt return that was highlighted by a few great – and questionable – blocks, but there is a couple more things to cover. ... Bob Condotta gives his impressions of the game, with the offense still not clicking as it should. A big part of that was Wilson, who doesn’t seem on top of his game. He thinks the guys will be “just fine.” ... Hats off to the veterans. • Mariners: Watching the Mariner game between plays in San Diego, I was struck with how bad the conditions looked in Chicago. I never noticed the rain stop falling, but the game went on. Of course it did. It had to. The M’s had a comfortable lead – well, a three-run lead – when Hisashi Iwakuma left, but then they had to hold on for a 7-6 victory. ... Now that Jack Zduriencik is gone, leaving behind a damning legacy, how do the M’s build a winner with their roster? • Sounders: If there is such a thing as a “must-win” match, the Sounders are playing one today. Portland comes to CenturyLink with Seattle needing the three points to inch closer to the playoffs. ... Not many folks think the Sounders, still in a funk thanks to injuries and national call-ups, can win this one. ... But never count either team out in the best rivalry in the MLS. ... Real Salt Lake suffered an important loss.